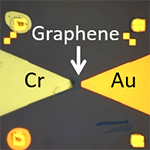 Authors: Cai, X.; Suess, R. J.; Drew, H. D.; Murphy, T. E.; Yan, J.; Fuhrer, M. S.
Abstract: We use an ultra-fast near-infrared pulse coincidence technique to study the time, temperature, and power dependence of the photoresponse of a bi-metal contacted graphene photodetector. We observe two components of the photovoltage signal. One component is gate-voltage dependent, linear in power at room temperature and sub-linear at low temperature-consistent with the hot-electron photothermoelectric effect due to absorption in the graphene. The power dependence is consistent with supercollision-dominated cooling in graphene. The other component is gate-voltage independent and linear in temperature and power, which we interpret as due to thermoelectricity of the metal electrodes due to differential light absorption.